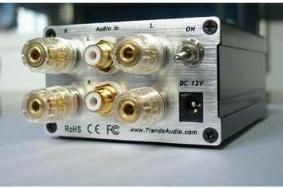 Trends Audio adds a tiny power amplifier to its pocket-sized range | What Hi-Fi? The new TA-10.2P, which will sell for HK$1395, or around £110, delivers 2x15W from an enclosure just 7.6cm wide, 4.6cm tall and 15cm deep, and has stereo line inputs and outputs for a pair of speakers. It's all done with Class-T Tripath amplifier modules, and Trends Audio says the use of audiophile quality components throughout gives the TA-10.2P the ability to perform like conventional Class A/B amps in terms of warmth and detail, while still delivering 90% power efficiency. Tuning is available via small potentiometers to adjust the DC bias voltage between the speaker terminals, and the unit comes complete with its own offboard AC power supply. It's available now for preorders at Trends Audio's online shop.